This weekend just gone a minor twitter storm in a tea cup brewed. “What’s on your iPod?” Ellie Goulding was asked in an interview. “I really love the alternative music scene and people like Fleet Foxes and Wild Beasts, but I’ve also got Friendly Fires to Rihanna and Beyonce. I’ve even got Don’t Stop Believing,” Ellie answered. It didn’t find favour with the controversial hormonal punk-pop London four-piece Pris who tweeted Ellie’s answer to their followers with the statement “Why Ellie Goulding is a massive wang.” Pris you may remember have previously (and somewhat hilariously) rubbished Guillemots, Adele, Jessie J (relating her to Mystic Meg) and Noah and the Whale. Pris have been picking up support from the likes of Eddie Argos (Art Brut), Nicky Wire (Manic Street Preachers), Everett True (music critic) and a number of UK music blogs including Just Music That I Like, Sweeping The Nation, Von Pip Musical Express as well as ourselves over the last few months. It was one of these bloggers – Von Pip who re-tweeted the Pris tweet. Then the fun began. The irony in this miniscule wangate was that neither Pris, Spark or her manager were probably aware that Twitter has a new head of operations in Europe. His name? Mr Wang. We wonder what he would have thought of his name being used in this context. So for Mr Wang here’s the debut single from Pris – The Better You Look The More You See - streaming courtesy of Von Pip on Soundcloud. He’s one of the most credible (and funniest) UK bloggers out there, wang or not. That’s not sycophancy from Breaking More Waves – just what we think. Likewise we love the music of Ellie Goulding. We enjoy a fair amount of Spark’s as well. We’re kind of hoping that Pris will call us wangs for doing so and even if they do, we’ll still love them as well. Pris play a variety of shows in London in the next few weeks and have also been confirmed for Breaking More Waves hometown multi-gig multi-venue festival in September, Southseafest, alongside the likes of Johnny Foreigner, Die! Die! Die!, Trophy Wife, The Miserable Rich, Bleeding Heart Narrative, Dry The River and My First Tooth with plenty more to follow. 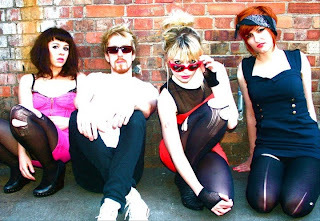 Catch Pris live then and enjoy their sassy-pouting-splenetic-indie-punk-pop whilst you can. Pris - The Better You Look The More You See. Thanks for the 'War Of The Wangs' shout out !! I guess some folk just have zero sense of humour and aren't really aware of Pris and their mischief making. For me they make a refreshing change to anodyne careerists and the backslapping pop luvvieness' that can occasionally breakout on Twitter. Obviously I wasn't bothered with reference to the slings and arrows , in fact I re-tweeted that too , and it goes with the territory being a "humble blogger" n'all. However being asked to justify re-tweeting or indeed being lectured on what I can and can't write about is of course a whole different issue. I’m sure some artists would love every single review/tweet/ discussion to be universally positive and that bloggers only wrote about what they liked (which i think we do in the main) but if you’re going to be that sensitive to a bit of childishly amusing banter, then I dread to think what the reaction might be if Everett True decided to review your songs, and shock horror, didn’t like them. If you can’t stand the heat you maybe in the wrong kitchen. I'm sure Pris don't give a f**k, which is of course part of their appeal.